About a year ago I bought a cute vintage Maxwell House coffee tin at a local city wide garage sale. 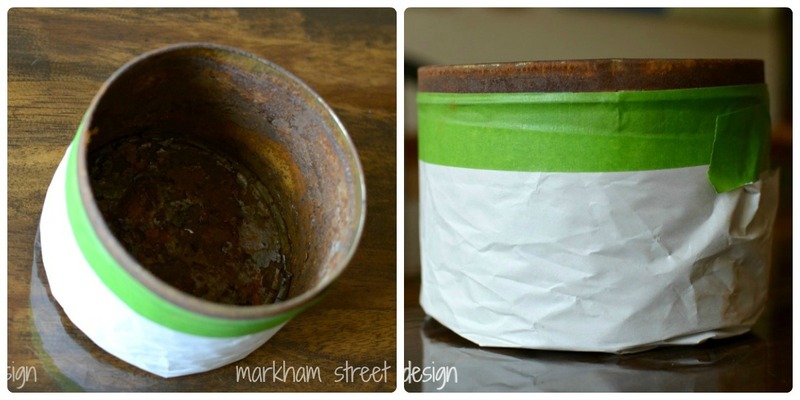 I loved the tin but really didn't have a use for it other than just decorative. That was until I saw this post over at Brooklyn Limestone. I just loved this vintage coffee tin tiered tray and jumped on eBay as quick as I could to see if I could come across any good deals on a couple of tins so I could make a similar version for my home. Vintage coffee tins vary in price- by a lot. I ended up bidding and winning one for about $5 plus shipping and then another deal I couldn't pass up- 2 cans for only $1.25 plus shipping. Yay!! Ms. Limestone used power tools and hardware parts to build her tiered stand. Power tools are a little intimidating to me (and possibly the main reason some projects sit uncompleted in the junk room for so long!). My solution was to purchase a few skinny brass candlesticks from my local thrift store. At $2 a pop, they seemed like a great and easy way to add the height I needed between the cans. Some of my cans had seen better days and were quite rusty. I decided to give everything a quick coat of primer and silver spray paint to give all the cans and the candlesticks a uniformed look. I wrapped and taped the outside of the cans to protect their labels using old newspaper and frog tape. To attach the candlesticks, I lined the bottom ring with E-6000 glue and centered it in the bottom of the tin. Once that was centered, I put a ring of E-6000 around the top of the candlestick and centered the other tin on top. E-6000 is a very strong glue but it does take a little while to fully cure. I gave it just a little time to lock in place before I loaded the tins full of all the coffee goodness! I decided to make my tiered trays only two tiers (for now). I didn't know if three tiers would fit under my cabinets but I can always add a third tin with another candlestick and a little glue! I am using mine for our k-cups (ignore the about to fall k-cup!) but the tins could be used to hold tea bags, sugar packets or even the individual creamer cups. Fun and simple project. Although I didn't hoard the parts for all that long, it feels good to scratch something off the list!! Any fun and simple projects you have been wanting to get around to? Two down! 29 to go! !